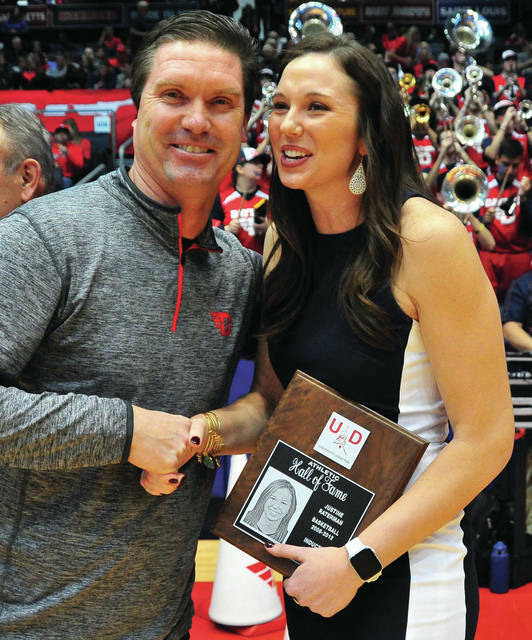 Former Versailles and University of Dayton basketball standout Justine Raterman is congratulated by fellow Hall of Fame member Brian Harlamert after her induction into the University of Dayton Hall of Fame. Raterman followed a 27-point, 19-rebound effort in a 75-60 win over South Euclid Regina in the semifinals, with a 17-point, 10-rebound performance in a 51-33 win over Sugarcreek Garaway in the state championship game — played on a Monday due to heavy snow on Saturday. She earned MVP honors for the tournament. The numbers she accumulated along the way speak for themselves. Dayton won its first A-10 title her senior year and had a record of 90-41 during her four years in the program. But, what truly epitomized Raterman was what took place at the A-10 tournament in 2011, her junior season. Despite tearing her ACL in the semifinals, she played in the A-10 championship game the next day. “I decided I was still young, I would take a chance,” Raterman said about her passion to be around the game. And what does she recall from her time as a Flyer?